Mumbai: The narrative around distressed steel assets has been one about incumbents consolidating their hold over the sector. On Friday, ArcelorMittal was declared the highest bidder for Essar Steel Ltd. Its winning bid of ₹ 42,000 crore gives the world’s largest steel producer a sizeable foothold in the Indian steel market. Who wins and who doesn’t after this transaction? Essar Steel’s financial creditors have got a good deal. The bid value represents 85% of the ₹ 49,395 crore of their claims. That’s a very good recovery rate, possibly beyond their wildest estimates. But they must not forget that this was possible only because of an uptrend in the steel price cycle globally and healthy domestic demand. It’s up to them to ensure better appraisal and risk management to ensure they don’t find themselves in this position again. The insolvency framework may appear to be another winner in this case, but that’s not entirely true. These final bids were submitted subsequent to a Supreme Court order. The court had actually held the ArcelorMittal and Numetal Mauritius bids as ineligible, since related corporate debtors of both bidders were defaulters. The court held that these defaults must be cleared before the bids were submitted. However, it made an exception in the Essar Steel case, on a request from the committee of creditors, giving the bidders one more chance to clear defaults. What has become clear is bidders cannot be eligible by simply selling their stakes, just prior to submitting bids, in related defaulting entities. To even submit a bid, the default should have been dealt with first. This should reduce the scope for litigation on this front. That’s why ArcelorMittal paid ₹ 7,469crore of debt of Uttam Galva Ltd and KSS Petron Pvt. Ltd to become eligible. To that extent, ArcelorMittal’s investment is higher in its bid to buy Essar Steel. That brings us back to ArcelorMittal India plans. It had pointed out bottlenecks in Essar Steel’s steelmaking and casting process, which meant Essar Steel’s crude steel output could reach a maximum of 6.1 million tonnes compared to a possible 9.6 million tonnes. Increasing capacity utilization is likely to be the immediate objective, followed by potential investments in value addition, modernization and expansion. Once the resolution plan is finalized and implemented, ArcelorMittal is likely to lay out its own plans for a turnaround. It had disclosed earlier that Essar Steel would be owned in a joint venture with Nippon Steel and Sumitomo Metal Corp. That will lower the financial burden on its own balance sheet. Stiff competition for Essar Steel has meant that it has not come cheap. ArcelorMittal has paid a premium not just to acquire a large steel asset with port-based facilities in a fast growing market, but also to get a running plant. Setting up a large greenfield steel plant in India has proved to be a nightmare. This cuts the time down to set up a plant to that taken to complete the resolution process. In FY17, the latest year for which financials are available, Essar Steel earned an Ebitda of ₹ 2,841 crore, but depreciation alone amounted to ₹ 1,903 crore. Ebitda stands for earnings before interest, tax, depreciation and amortization. Its interest cost in that year was ₹ 5,608 crore and it ended FY17 with a net loss of ₹ 5,198 crore. But FY18 financials may look better, based on how listed firms have fared. For local shareholders, whether ArcelorMittal makes money or not on the acquisition is of academic interest. It is not listed locally. What matters is how it runs the business, the investments it makes and how aggressive it becomes in the market when output rises. 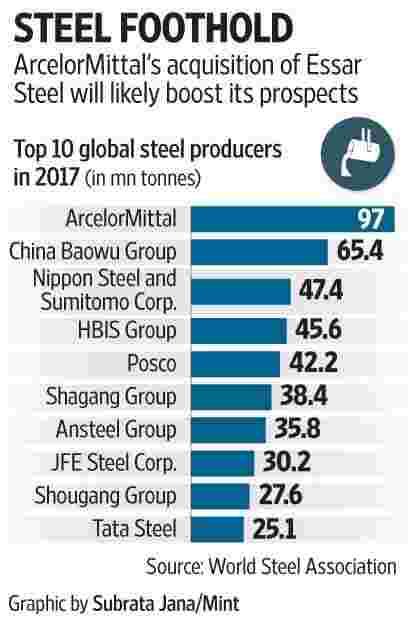 While India is critical to the profitability of domestic steel firms, it is only one of the many markets ArcelorMittal is present in. It may think differently about its growth plans and profit targets, which in turn could be a risk for investors in steel stocks.